Note: InfraRed Light is not visible to the human eye, but will show up in the viewfinder of your cell phone camera. Click here to learn all about the LightBridge. We introduced the DerbyStickTM a few years back and it's still the smallest 4 lane timer on the market. * Our Top Seller! Uses the same hardware and software architecture as our Turbo and Turbo Lite models. Click here to learn all about the DerbyStick and DerbyStick Packages. 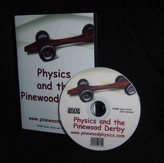 Physics and the Pinewood Physics - DVD. An educational video that uses the Pinewood Derby to encourage your child’s interest in Physics. Dr. Scott Acton used our DT8000 Timer to run tons of data collecting experiments and he shows you the results of each of these with in depth explanations. This video focuses on how to win and which techniques are most important. When your child brings home a trophy, he/she will gain a new appreciation for science! •Use the principles of physics to build the fastest car possible, within the rules. Set the weight and center of mass of your car to maximize speed. •Reduce the effects of friction. •Align your car’s wheels to near perfection. •Maximize your child’s involvement in car construction without compromising quality. •Build a simple test track in your garage.